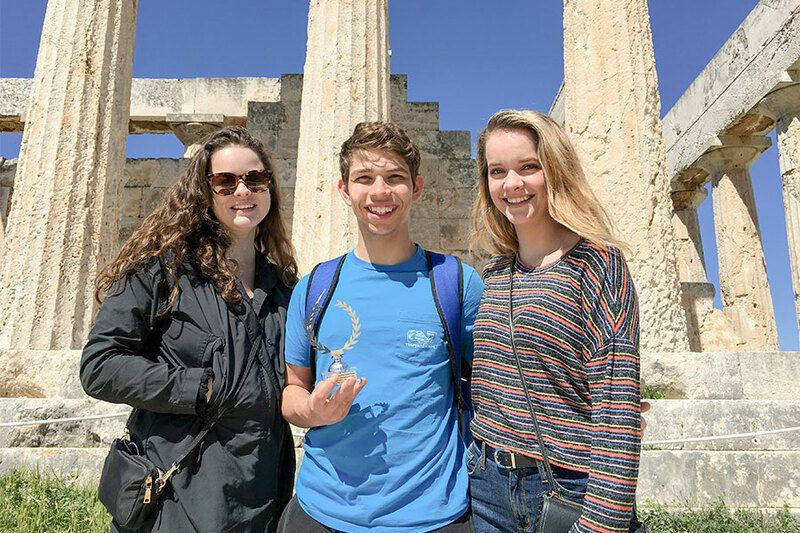 Principia’s mediation team made a strong showing at the 2019 INADR International Law School Mediation Tournament in Athens, Greece, in March. The team, composed of juniors Brittany Duke and Mackenzie Batten and sophomore Hunter Hummell, claimed ninth place in Team Advocacy and reached the semifinal round of 16 teams. Of the 54 teams competing, Principia was one of only two undergraduate teams—all other teams were made up entirely of law school students. Case topics included negotiating a border dispute between Tanzania and Malawi, breach of contract claims, defamation and loss of business against media journalism, and other issues. Students also took part in on-site training sessions and workshops in preparation for the competition rounds. Principia's team earned a spot at the tournament based on their strong showing at the 2018 International Intercollegiate Mediation Tournament Championship last November, where they placed first, second, fourth, and fifth in different categories. Principia also won the H. Case Ellis Spirit of Mediation Award for best exemplifying the principles of advocacy—our second consecutive Ellis award. Following the tournament, Principia’s team toured Athens, taking in the Acropolis, Temple of Olympian Zeus, and the nearby island of Aegina. Upon their return to campus, faculty, staff, and classmates celebrated the team with a cake served in Howard Center, where Dr. Heidi Snow, interim dean of academics, acknowledged their achievements and the value of the tournament experience. “The entire squad contributed to these extraordinary outcomes,” notes Dr. Jeffrey Steele, multidisciplinary faculty member and the team’s coach.